During the holiday season of 2002, they used to run short, maybe 15 second commercials for this album on television. It must have been late at night, maybe on MTV2? Although I never watched that channel...it couldn't have been VH1 Classic, could it? Who cares, I saw 'em. I liked the animation in the ad, the short clip of one of the songs that accompanied it, and I thought the title of the album was pretty clever. So, I told my girlfriend "I think I want that CD for Christmas." I may have said it a couple times. Probably every time the ad aired. I'm annoying like that. So, she remembered, and on Christmas day it was under the ol' tree waiting for me. It was actually a bit exciting, as I was pretty much past the point of taking chances on music, meaning that I rarely bought stuff without hearing it first. Upon initial playing of the album, my girlfriend said "Wow, that really sounds like the guy from Lagwagon." As it went on, this turned to "No, that is the dude from Lagwagon." I, of course doubted her, and was, of course, immediately proven wrong. I had inadvertently attended a Lagwagon show in Eugene, many years before all of this. They were a fun enough pop-punk band, and I knew my brother liked them. But it wasn't exactly high-brow material. 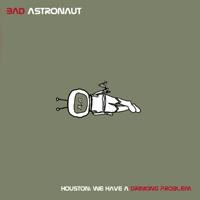 So, when I heard the serious tone of Bad Astronaut, I clearly didn't put the two together. Anyway: turns out it's Joey Cape's side project, an outlet for his heavier-themed material. The album's nice enough (the stronger parts sound a bit like Grandaddy) but I could never really latch onto it for some reason. The songs are all very different, which is great, but they're sequenced so that there is very little flow to the record. The darker stuff is great, but it eventually segues into some fairly generic spurts of pop that make it seems a bit lazy. I still think the title is great, though.